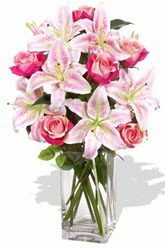 Send this magnificently, glamorous bouquet of sensational, pink Oriental Lilies and premium long stem, pink Roses and leave your special someone feeling like a superstar. 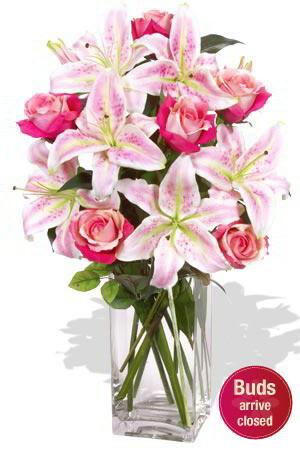 Glamorous is your passport to success.Lilies may be sent closed/partially closed in order to prevent damage and to last longer.Vase not included, however if you would like to make your flower gift extra special, why not add a vase to your order? We recommend a Superior Vase to leave a lasting impression. Good service and quick execution and delivery. However, a different than the ordered bouquet was delivered without prior notice or reason why. Hence only 3 stars, otherwise would be 5. The delivery was right on time and the flowers were beautiful.